Included for the same price: -Top Box for your stuff -A waterproof and windproof special motorbike coat and pant -A helmet I sell my scooter with all the stuff you need for all weather conditions. 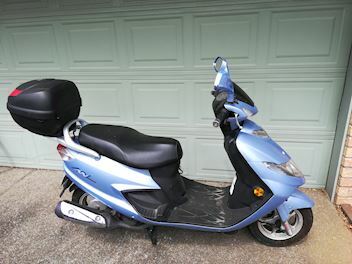 The scooter is in very good condition and it's perfect to drive in Auckland. I used it for few months and it's the best solution to circulate in Auckland through the traffic jam the morning and end of afternoon and very easy to find a free parking for motorbike even in the CBD. You can also use it to circulate on the motorways, you can drive at 100/110km/h easily. Also it's very economical specially if you work or study in the center, it's the solution, better and more economical than the bus. WOF: 21/03/2019 REGISTRATION: 21/03/2019 Full tank: 2.5L for $ 5 NZD => 150km easy If you have any other questions, let me know. PS: If you're interested I can drop it wherever you want in Auckland. Thanks.